Father's Day in the United States was not really observed until the early 20th century when it was added as a counterpart to the popular Mother's Day celebration. It is now observed in over 40 countries worldwide. While most celebrations fall on the third Sunday in June, many countries have their version of Father's Day. It seems as if there are as many days to celebrate dad as there are types of fathers. And speaking of the many different kinds of dads, Cactus Flowers has the perfect gift for the special man in your life! Is he a health nut? If your dad is no couch potato and watches what he eats, perhaps he'd enjoy the HEALTHY GOURMET BASKET TF158-3. Or has your father never met a snack he did not like? SNACK ATTACK CFE429 hits all points-sweet, salty, crunchy, munchy and then some! Does your dad like sitting down with a cold brew to watch the game? Surprise! 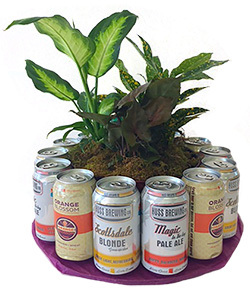 Cactus Flowers now delivers microbrewed beer six packs of Huss Brewing's Magic in the Ivy, Scottsdale Blonde or Koffee Klatsch or Papago Brewery's Orange Blossom. Our new BEER GARDEN is sure to put a smile on his face! If your pops is a more business-oriented gent, perhaps he'd like a nice green plant for his office. Or our GARDEN OF ZEN CFE369 is a nice desk-topper of easy-to-care-for succulent plants, which are quite trendy. And you know what, some men aren't ashamed to receive flowers. In fact, most of the time our delivery drivers report back that gentlemen are absolutely thrilled to receive flowers as a gift, simple because it is so unexpected! Of course, you wouldn't want to send him a pink fluffy ball of cuteness, but something more unusual in masculine colors would certainly fit the bill. ALOHA BEAUTIFUL CFE299 or BONFIRE CFE452 are great floral gifts for dad. Please visit our website and check out the Father's Day category, or call us at any one of our five locations for great ideas!